At last. I could participate timely in Randy Seaver’s “Saturday Night Fun” http://www.geneamusings.com/. That’s because this particular Saturday night I was not at the opera to see Fidelio or even at the local cinema, or favourite of all, dining out au celebrity chef du jour. Something askew with my social calendar. Not that the offerings at the local cinema---various Oscar nominations---are that appealing. It’s all personal, of course, and one must read all the reviews before committing oneself to popcorn with ersatz “topping” on it. Must say the opera house sadly lacks popcorn. I digress. Not having anywhere even remotely handy a pedigree chart or ahnentafel, I had to scramble around without leaving my desk to find ancestor #21. There she is. The paternal grandmother of my father's mother. Flory McLean. McLean or Maclean or numerous howevers. Randy has vital stats for his #21. I don’t (whine). d) on the passenger list of the ship St. Lawrence, age 50, sailing from Tobermory, Scotland, for Ship Harbour (Cape Breton), Nova Scotia, on 12 July 1828. When you come right down to it, I can’t even write a blog about Flory, who was formally called Flora at the baptismal times. If you ever tried researching Highland Scots before the Presbyterians got serious about keeping track of vital events, you know what I’m dealing with. On the small island of Coll in Argyllshire, the name Flora McLean was what you could call a dime a dozen. Like every other name there. Family tradition ruled out imagination in naming children. But genealogists are a persistent bunch. Eventually the torch will pass to—yoo-hoo—next generation. Oh lookie, see what I found. My Autographs book from the ancient past. Brenda began cleaning out and organizing memorabilia stashed in the lovely old Chinese chest my mother bought on her honeymoon. Someone in the family gave me the book when I was pretty young. It was a fad to get your school friends and even smarter people if you could find them to write a clever verse or popular saying. Limericks were commonly employed too. Signed Viola. I wonder who Viola was! Signatures of eternal friendship included such side-splitters as “Yours till grama-phones,” or “Yours till the ocean wears rubber pants.” Figure that one out. There were better ones, but it appears that at some point I used an early version of cut and paste, or simply cut. Simpler times? I wonder what kids today would write? Way back when, I made a classic research error in my initiation to family history. The gravestone of my emigrant ancestor gt-gt-grandfather John Dougall was specific about his birth in Scotland. (1) I found the reference to the Quebec cemetery in my father’s papers and was later able to visit the site. Fortunately I had the wits to photograph the stone. St Andrews Protestant Cemetery, St Andre Est, Quebec; photograph c1972 by BDM. My father had hired a research firm in Scotland to pursue the Dougall ancestry. Their report placed John Dougall in the family of James Dougall and Jean Hall of Parkhead village, then on the eastern outskirts of Glasgow and now part of that city. The date of birth/baptism was not an exact match with that on the gravestone, but Brenda spent time with the fledgling IGI (International Genealogical Index) at LDS Family History Centers trying to further this lineage. Meanwhile, networking is good. Networking was possible, although slower, in the days before the Internet was invented. I met Salli and through her, different lines of descent from my John Dougall. John’s family bible had been lost, but a neatly transcribed version existed of the inserted vital events, made by an interested descendant. (2) The bible also stated Parkhead as John’s place of birth. The classic mistake? Not paying attention to every bit of information on the gravestone and not obtaining a map at the outset. 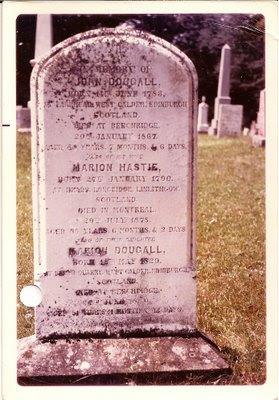 Contact with Richardson Dougall, who was a descendant of James Dougall and Jean Hall, confirmed from his extensive research that my John was not part of that family. (3) That explained discrepancies in the birth/baptism date and my floundering around in parish registers in the vicinity of Glasgow. I was learning that geographical and administrative boundaries are rather important. Parkhead was also the name of a hamlet or farm in Linlithgowshire (later to be renamed West Lothian). This Parkhead was located about one mile south of Abercorn village, not far from the Firth of Forth—a large-scale ordnance survey map is worth its weight in gold! Although Edinburgh on the gravestone seems a bit extraneous to the description, along with West Calder it had been overlooked as a geographic clue. Ultimately, Glasgow environs did not enter the picture at all. Part of my original mistake was taking the Scottish firm’s research as pure fact. After the bumpy start, my research switched to the correct avenue. West Calder was the name of the parish and where John Dougall (and many of his children) was baptized 20 July 1781, the son of Thomas and Marion (Pollons) Dougal [sic]. (4) The minister wrote that the parents were residing in Parkhead at the time. John’s date of birth was transcribed as 14 January 1783 in the family bible. His cemetery stone states 14 June 1783 as his date of birth. The "Kirk of Calder"; photograph from http://www. westcalder.co.uk/#/photos/. The church dates to before 1550. I had encountered my first need for a proof argument, although the delineation of genealogical standards was yet decades away. When was John born amid those conflicting statements? As genealogical sources, the parish register and the cemetery stone are original; the bible transcription is derivative. The relevant information in all three sources needed even more thought. Because the bible information is based on a now-missing artifact, it bears the least weight as evidence—how legible was the handwriting? Did it show short forms for months unfamiliar to or misinterpreted by the transcriber? Since the bible was allegedly published in 1810, how accurate was the bible inscription some thirty years after the fact? Or did someone enter all the family births fifty or sixty years later? Even non-genealogists can see the questions that arise, with no answers. Whoever provided information to the stone cutter for the cemetery was giving him secondary information about John’s birth, i.e. was highly unlikely to have been a witness to that birth. The day and the year “match” the bible information, but not the month. Then we have the parish register created by the man who performed the baptisms. His information was primary, as a participant in the event. Usually we assume that clergy recorded the event at the time or soon after (although that’s not always the case, as we may be able to argue in certain situations). What was the upshot of all this? The conclusion is that John Dougall was baptized on 14 July 1781 so he could not possibly have been born in 1783. There are some side issues discussed about the two appearances of January, but I think this is enough for semi-interested family members and neophytes to hear at one go. That’s my early sleuthing story and I’m sticking to it! (1) Suzanne LeRossignol and Pennie Redmile, St Andrews East Protestant Cemetery, St Andrews East, Argenteuil County, Québec (Quebec Family History Society, 1991). (2) Helen Locke, transcriber, Family Bible of John Dougall (c1781-1867), published Edinburgh, 1810. (3) Several of Richardson Dougall’s family histories have been deposited with the National Genealogical Society’s collection in the St Louis County [Missouri] Library, including James Dougall of Glasgow (1699-1760) and his descendants through Dougall and McDougall lines in the United States and Canada. (4) West Calder old parochial registers (OPR), baptisms 1645-1854, marriages 1677-1840; Family History Library microfilm 1067792. Sibelius Monument, Helsinki, Finland. Photograph October 2006 by BDM.